Around the corner, there was a display of Russian-looking ballerinas on a tightrope. Of course, every amateur thinks he should really be a professional. 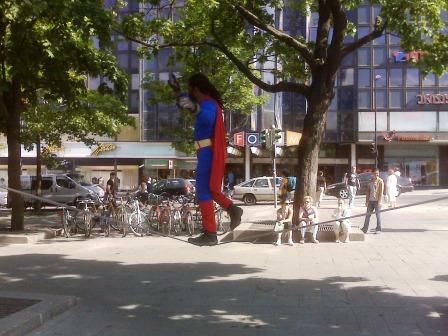 So, one guy made his own tightrope (though not very tight) between two trees and donned a Superman costume. He yelled “Showtime!” repeatedly and asked that we put money in the jar. If I had had change with me, I would have. I only had my blackberry, so the pictures aren’t all that great. But, you get the idea. 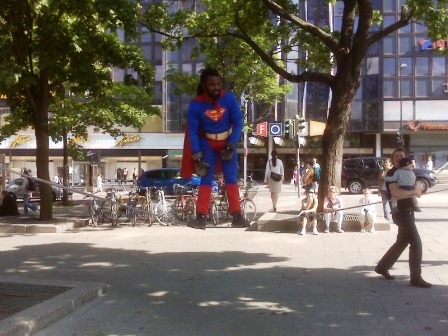 This entry was posted in Uncategorized and tagged Helsinki on June 7, 2008 by Tom.